Goldendoodles are a wonderful crossed breed that can be a great choice of dog for those who have allergies, or for those who want minimal shedding in their home. Coming in a variety of sizes, they fit in with the family that prefers a clean indoor companion with a super sweet temperament! The idea of these crosses came about in Australia in the 1980's. The Guide Dogs Victoria bred a Standard Poodle named Harley to a Labrador Retriever named Brandy in a deliberate attempt to provide a blind client with a dog that her allergy-plagued husband could tolerate. It was hoped that the puppies would be a mix of the wonderful "eager to please" temperament of the Lab and the allergy-friendliness of the Poodle. Out of three puppies, one had the qualities needed to be a successful guide dog with an allergy-friendly coat. Thus was born the "Labradoodle". Since this cross met with such great success, this eventually led people to the crossing of a Golden Retriever with a Standard Poodle, and eventually Miniature and Toy Poodles. According to Goldendoodles.com, these family friendly dogs have been bred in North American and Australia since the mid 1990's and have also been called Golden Poos, Goldie Poos, or Groodles. The earliest known use of the term "Goldendoodle" comes from the Neeland's family in the U.S.A in 1992. The family started calling their dog, Sugar, a 'Goldendoodle' in response to a question from a passerby who asked “is that a Labradoodle?”. They replied, “No, it’s a Goldendoodle”, and have referred to her as such ever since. As the news has gotten out about these eye-catching, sweet-tempered dogs, they have quickly gained in popularity in the United States and Canada. Not only are they calm-natured and unique looking, they are highly trainable and have less inherited genetic problems because of the out-crossing to a greater gene pool. The United All Breed Registry registers first generation crosses of a Golden Retriever with a Poodle, called F1 Goldendoodles, second generation back crosses of a Goldendoodle back to a Poodle, called F1b Goldendoodles, and F2 and F3 Goldendoodles, a cross between a Goldendoodle and a Goldendoodle, all of which we specialize in. 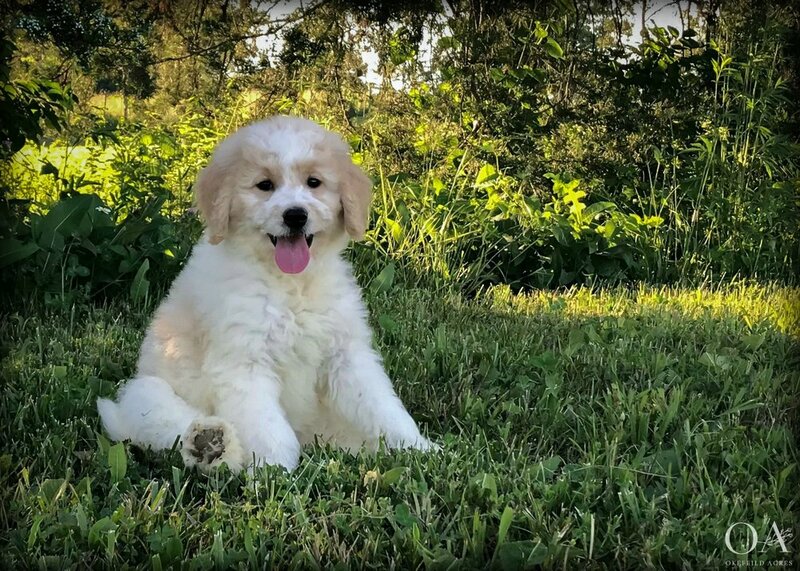 American and English Cream European type Golden Retrievers are used and because of the great variety of size available in the Poodle family, miniature sized, medium sized, large and royal sized Goldendoodles are available. 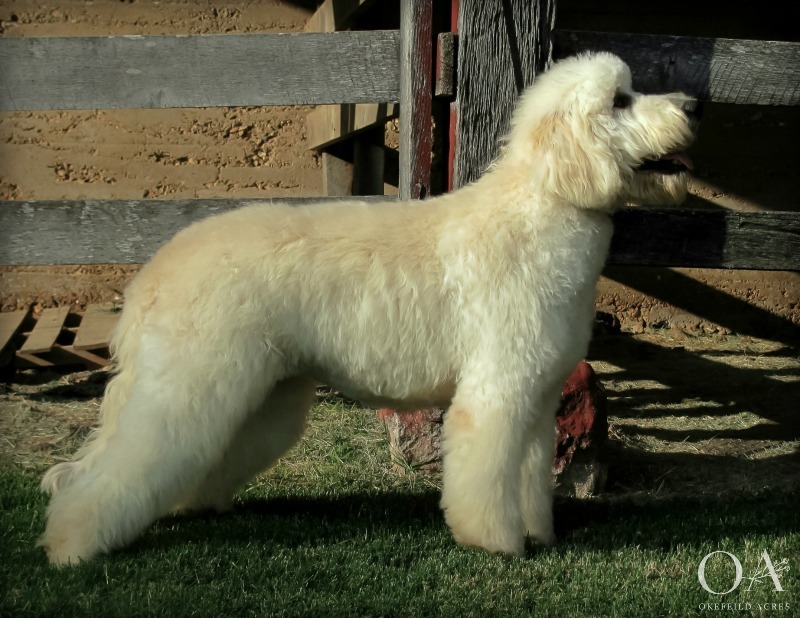 Due to the many coat colors in the Poodle family, Goldendoodle coat colors can come in Cream, Light Apricot, Apricot, Red, Chocolate, Sable, Phantom, Black and can also have abstract white, merle or parti markings. F1's, F1b's and F2's and F3's, also called Multi-Gens, can have a variety of coat wave, from slightly wavy to medium wavy, very wavy and curly coats. Typically, the more wave, the less shedding. American Type Goldendoodles are a cross between an American Golden Retriever and a Poodle or a Goldendoodle with an American Golden Retriever parent crossed back to a Poodle. English Type Teddy Bear Goldendoodles are a cross between an English Cream Golden Retriever and a Poodle or a Goldendoodle with an English Cream Golden Retriever parent crossed back to a Poodle. English Type Teddy Bear Goldendoodles typically have more full coats, a more broad head with shorter muzzle and possible ultra cream coats, than American Type Goldendoodles. Click the link below for a description of the English Type Golden Retriever standard and an article talking about the development of the Golden Retriever in Europe and the United States and Canada.